Pierre-Marie Châteauneuf, luthier for PMC, is a great guitar builder from Montpellier in France. I am reviewing here a new creation of his with the Thelonious model. With PMC, we are in the high class guitar area. Starting from the choice of woods to the attention to details and quality of the building, the guitar is a great job and it sounds awesome as you can judge for yourself in the video. The look of the beauty is beautiful, simple and elegant. The absence of the usual mark on the fretboard further enhances the sobriety of the instrument. This feature necessarily requires a little time to adapt for guitarists (like me) who can feel a little lost without those marks. You adjust to it very quickly though. I even wonder if it there's is not some educational value to this sobriety as it forces you out of the beaten path ... However, the side markers on the neck are there so you 're not completely on your own. 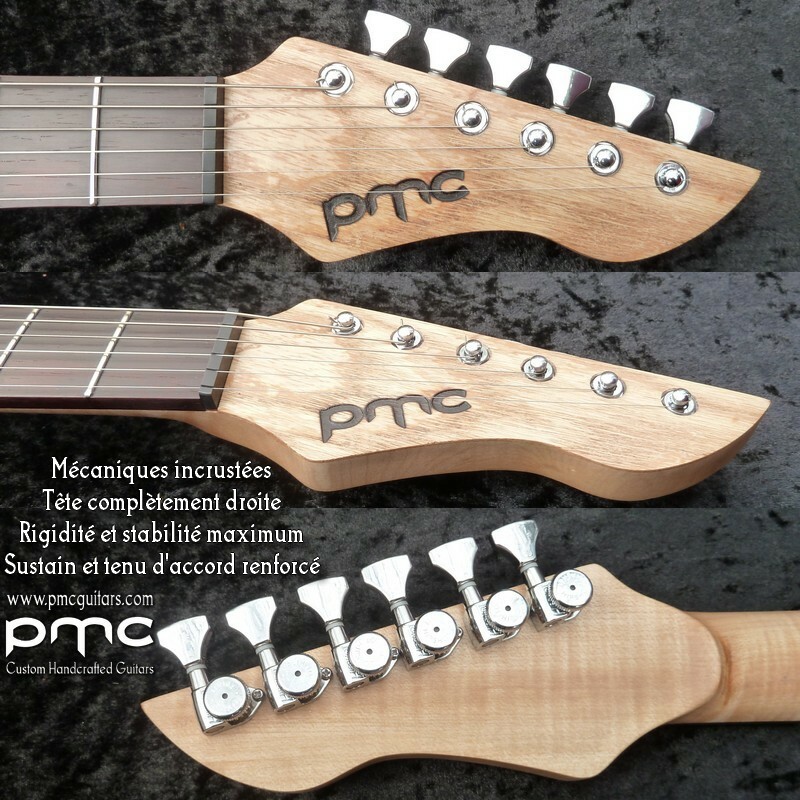 As you can see in the pic below, starting in 2014 Pierre-Marie has implemented a new technique on his guitars: the tuning pegs are placed inside the headstock thus eliminating the need for a string retainer and improving tone and sustain. It's obviously difficult to judge the impact of this by itself but I can only say that the sustain of the Thelonious is impressive and the tones are great. The Torpedo CAB (HP simulator) is set to the default Marshall patch. 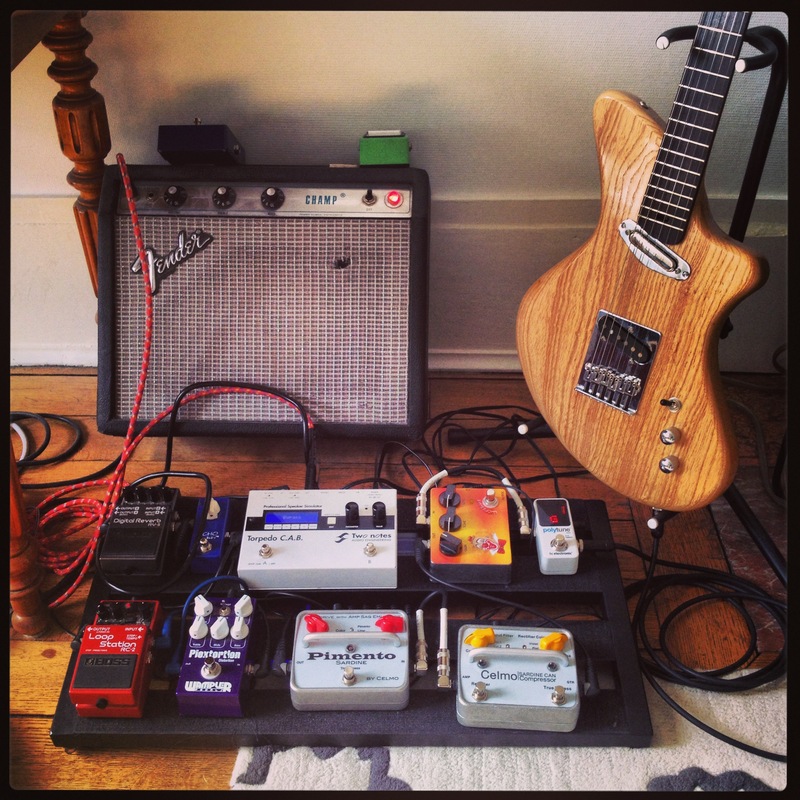 If you are looking for an ergonomic Telecaster with a quirky look, the Thelonious is a serious option. Although the instrument has a very simple electronic the array of sounds available is great. In particular, the push-pull tone knob that directly sends the output to the pickups to the jack via the selector allows a slight increase in volume and a net increase of highs that bring all the "twang" typical of the Telecaster.